Whilst everyone celebrated V-day on the day itself, me and the hubs celebrated a couple of days later. No, not because we are being cheapskate to avoid expensive food on that day (but to avoid the crowd, yes), but because on Fridays, we need to pickup baby G from my mum's place after work. So it would be too late if we were to celebrate V-day and eat out before going to my parent's place. So we celebrated V-day on Sunday (instead of Friday) at Milwaukee Steak Corner located in Balakong (nearby Jusco Cheras Selatan). We went to my parent's place that day, and Milwaukee is on the way back to our hut. So, Milwaukee we went. We actually planned to have escargots, but when we saw the picture of the escargots in the menu, it was not appetizing as the whole thing is basically "flooded" in mashed garlic only, dry version - without gravy (we were expecting baked escargots in garlicky creamy cheese sauce, au-gratin style). So we ordered these baked cheese mussels for appetizer (because this was actually what we wanted to see on top of our escargots, heh). He wanted oxtail soup as well, but it was not available. 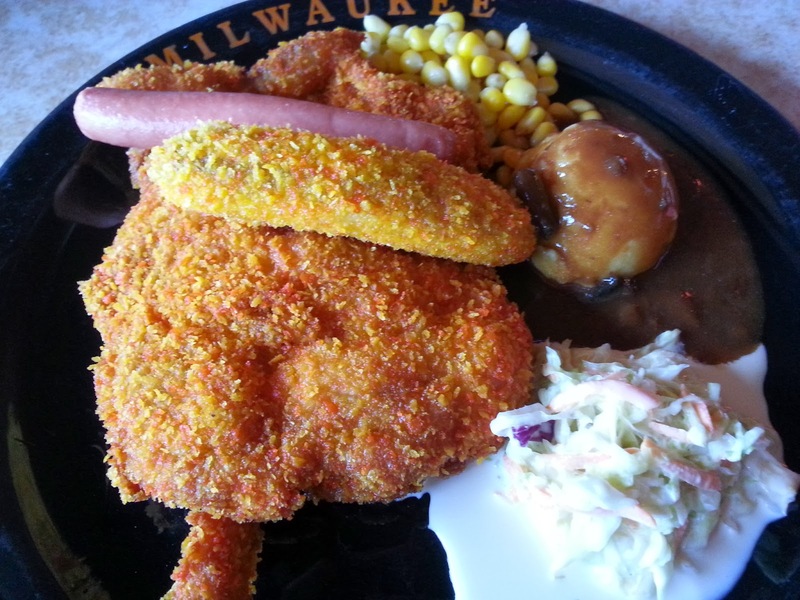 I am not adventurous and always order safe-and-simple food, so I had the chicken maryland because I like fried banana fritters. The banana fritter was crunchy and crispy outside, and very very sweet, soft & juicy inside. The hubs had lemongrass chicken and it was pretty simple which came together with a simple salad and a few slices of keropok only. He wanted to have something light as his tummy was not feeling well that day. If not, he would have settled for the ribeye steak. Call me a glutton, but we always order another main course to share. 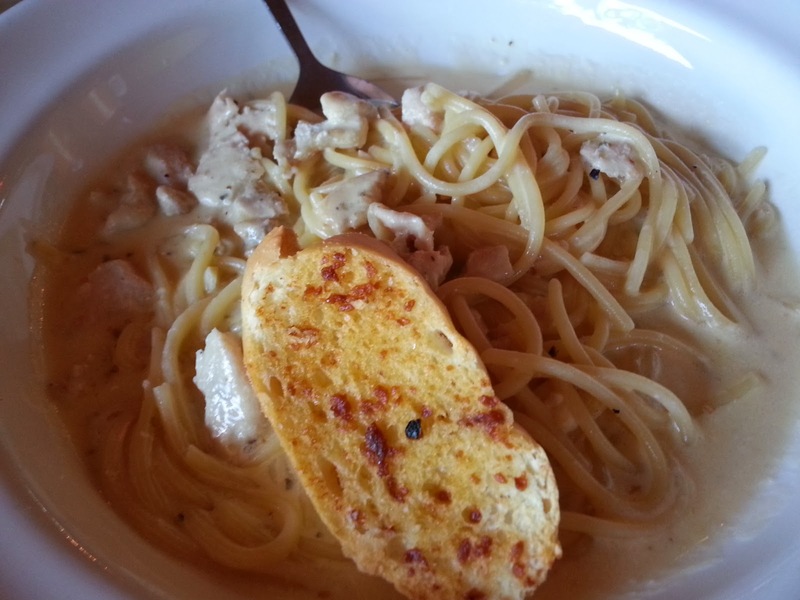 So we shared this chicken carbonarra. It was very nice and I almost licked polished the whole plate clean, not letting go even a single drop of gravy. 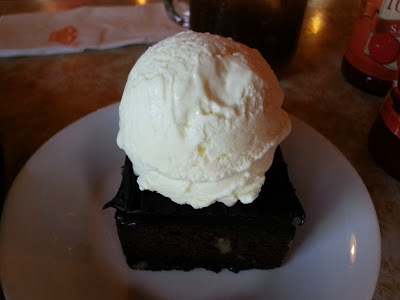 And lastly, for dessert, we tried their chocolate brownie which was served with a scoop of vanilla ice cream. We initially planned to order the banana split as we were already very full and it was less fattening, but on second thoughts, nahhh, just go all out and have the chocolate brownie instead! Eat first, diet later. Not advertising, but the food here boleh tahan if you want to try. I like coming to Milwaukee because it was one of our early dating place. The hubs used to bring me here for dinner during our courting days. Oohh, just in case you are wondering, no flowers for me on V-day. To be really honest, I was waiting (hopefully) in the office the whole day of last Friday to see if there are any flowers for me. Each time the office doorbell rang *ding dong*, I would wait excitedly to see if the receptionist brought any flowers in.. But no, nothing happened that day.. Guess girls will be girls.. Love receiving flowers..
adoi adoi...pecah perut jor...why the chicken look so obscene geh. Hv to piak the head of the chef. I like escargot too but sometimes not fresh and sometimes the restaurant mess it up. very kek hei. 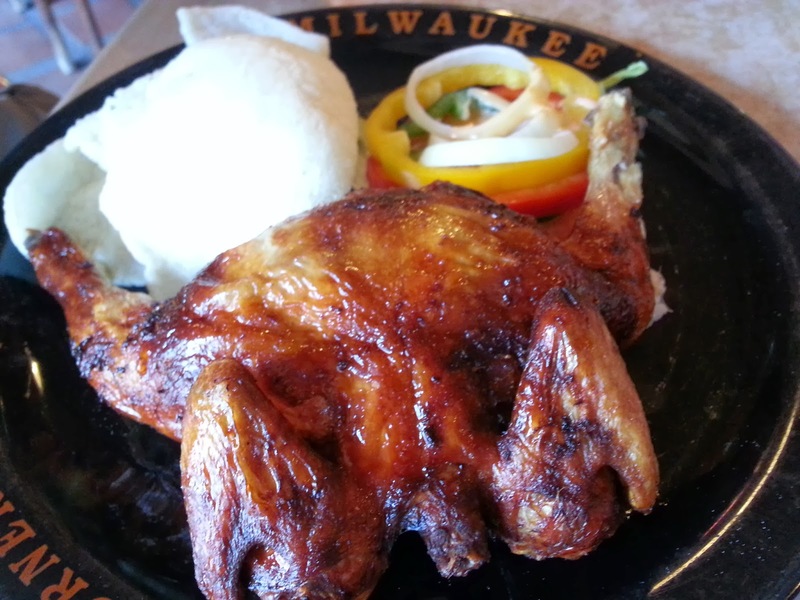 Kam ngam I am replying Phong Hong's comments, then ternampak you pulak..
Yep, the chicken looks hamsap.. Looks funny kan? That's why Phong Hong said it looks kangkang like that, waiting to be poked.. Ooops, sorry, I mean waiting to be eaten... I thinking dirty liao..
Agree with you.. Nowadays, they take out the escargots from the shell and serve separately in gravy (to cover the un-fresh smell kua).. I seldom see places serving escargots intact in the shells anymore.. Maybe got la, in high class dining places.. It is Valentine's everyday for me! I can see how all commercials are advertised to milk our hard earned money. I am glad that my wife doesn't like flowers, perfumes and designer stuffs. All the money saved, we can travel overseas more often. Anyway, that's all due to her sad and abused childhood life, no thanks to her parents. I will definitely visit Milwaukee someday to try since you have good ratings. I will inform the manager there that I came to eat after visiting your blog. I will pass him a paper with your blog links!! Hopefully he will send you a FREE MEALS voucher!!!! Haiya, I don't think they will be bothered sending me free meal vouchers la.. But if they really do, then I spend you makan there, ok? Keke.. 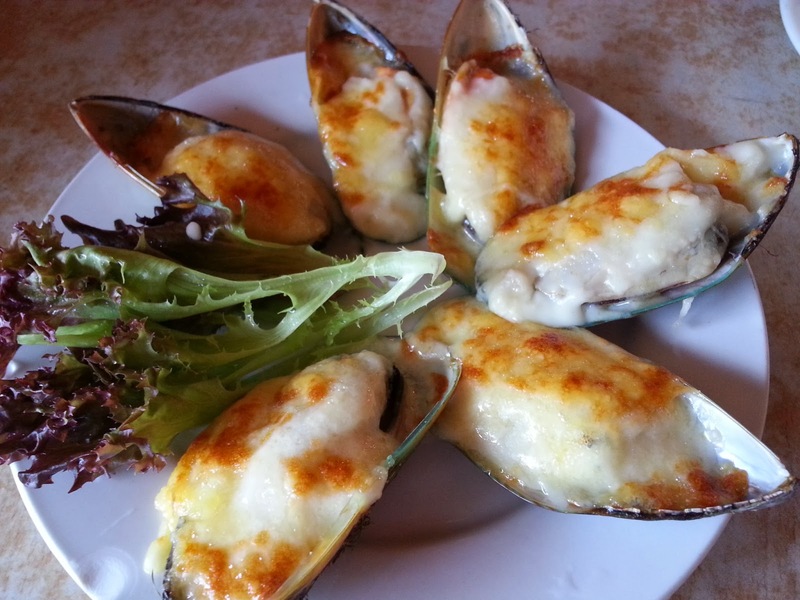 I would definitely love the baked cheese mussels! Yummy! I try to avoid escargots as I felt geli la. This is the first time I hear chicken carbonarra which sounds tempting! Woi, first time hear chicken carbonarra? Yau mou? Ooohh, I know, you think carbonarra means only bacon right? That was what I thought also, but now, macam-macam ada.. Beef carbonarra, chicken carbonarra.. You name it..
wah, where did you have that baked escargot that comes with garlicky creamy cheese sauce, au-gratin style one ah?? i have never tried such thing before, those that i have tried are simple and basic garlic butter only woh.. got cream cheese sauce tim gah?? like that will be very "lau" or not?? actually i love cheese, but then not really fancy those seafood baked with cheese style lah.. i very simple only lah, if the seafood is fresh hor, just cook like that and no need extra seasoning and "fah sun" already very yummy lor, agree?? Woiii Thambee..,the original chicken Maryland comes with Goreng Pisang la since many donkey decades ago! Only in your native slum India eat chicken Maryland with pampadam!!!!!! SK ahh SK, my turn call you jakun can ahh? TM's right, from day1, all the while, chicken maryland memang always comes with 1 sausage and 1 goreng pisang la.. Duh..
yes, it's actually nice to receive some flowers. But never mind la, since your hubby took you for a nice V-day dinner. I didn't have that chance. I just spent with my kids. Like SK said, if everyday tien-mi-mi with hubby and family, everyday also V-day la.. But I am still thinking of the flowers til today. Haha.. And today is already 20.02.2014. I'm still fantasizing of receiving flowers in the office..
Long time no receive flowers jor lor.. I received lots of them before I got married. After I got married, besides my wedding bouquet (which was inclusive in my wedding package), no more liao lor, sigh.. Wowwwww!!!! Food looks so so so good! Yep, the food boleh tahan.. The cheesy baked mussels also make my mouth water liao.. Even until today, when I look back at the pictures, I get hungry liao.. I dont mind celebrating V-Day a day or few days later. That was what we usually do in the past. No need to compete and rush with other people. The food looks yummy. I love baked cheesy mussels. Slurps!! Actually not only V-day.. Even both of our birthdays also we celebrate either earlier or later, never once before we celebrate on the real day itself.. Your V-day celebration looks wonderful! Haha, ya wor, blushing now.. And grinning away..
Psst, smooching everyday also got la, kekeke.. Nah, kidding..